When Can Creditors Pursue Claims Against Trust Assets? Florida trusts are not just useful when it comes to estate planning. They can also provide valuable protection for your assets against creditor claims–not to mention family members who have difficulty with managing money. For example, a spendthrift trust is a useful tool that allows you to help a relative while ensuring your money is not simply used to pay off their debts. 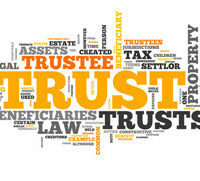 In Florida estate planning we commonly speak about trusts in terms of revocable trusts. A revocable trust is one that can be amended or revoked at any time by the person making it (the settlor). Such trusts do not offer any protection from creditors, however, since the trust assets remain fully accessible to the settlor. Similarly, if you create a trust that provides for periodic, non-discretionary payments to a beneficiary, the beneficiary’s creditors may seize those funds to pay off any debts. Indeed, the beneficiary herself could even use her interest in the trust as collateral when securing a loan. And of course, once a distribution is made to a beneficiary, he or she is free to spend (or squander) it as they see fit. A spendthrift trust can help avoid these outcomes. Basically, a spendthrift trust prohibits the trustee from making distributions to a beneficiary if said distribution would be “available” to creditors. Some trusts also give the trustee full discretion to decide when to make distributions to a beneficiary, which can also keep creditors from asserting any rights. Payment of any claim, such as a tax lien, held by the federal government or the State of Florida. Notwithstanding these exceptions, any other creditor will be out of luck in asserting claims against a spendthrift trust. This includes scenarios where the creditor relief on a beneficiary’s misrepresentation about the trust. In one notable Florida case, a state appeals court ruled against a bank that made a $350,000 loan to a man who said he had more than $6.8 million available to him through a trust. What the bank failed to learn beforehand was this was a spendthrift trust. So when the borrower defaulted on his loan, the bank was unable to pursue those trust assets. Ultimately, it was the bank’s fault for not doing its due diligence. Spendthrift and discretionary trusts are just some of the asset protection options that might benefit your family. A qualified Fort Myers estate planning lawyer can review your situation and develop a strategy tailored to your unique needs. Call the Kuhn Law Firm, P.A., at 239-333-4529 today to schedule a free estate planning consultation with a member of our team.